QI’m a new rat owner, and I got my boys Arthur and Merlin last month. I just wanted to say hi, and I’m looking forward to trying this AFRMA Calendar photo contest! I’m having a hard time getting my wild boys, as I call them, to stay for a pic! But I have an idea, so this weekend I’m going to try some baby food on an object so maybe they will stay! If you have more ideas, I’m open to all the help I can get! Thank you! AYou could also try putting a tiny dab of peanut butter or jam or smear of avocado where you want them to stop and sniff. Think of stuff your rats really like and try those. Also, Nutrical is something most rats really like and a tiny dab of that will usually work. For those with both sexes of rats, putting a female on the area then removing, then putting the male you want a photo of in that spot, will sometimes get him to stop and smell where the female has been. Also, be patient. I’ve found rats will eventually settle down after a few minutes so you can get the shot you are looking for. QPlease pardon my newness, but how do you mark a rat to tell it apart from the others? In rabbits, we tattoo, in cavies, an ear tag. AMost people keep different colors together so it is easy to know who is who in the cage. If the same colors are kept together, then a spot on the tail with a marking pen is the most common method used. If the rat is not to be shown, then you could clip off a bit of fur, or use a spot of food coloring or India ink (or other non-toxic dye) in different areas. These methods world have to be redone/reapplied as the fur will eventually grow in and the colored spot will fade. If you need a permanent method of ID, you could tattoo a series of dots or a number on the tail (similar to tattooing a LaMancha goat that has no ears). You would need something to hold the rat while you tattooed the tail—a clean cleanser powder can, i.e. Ajax, Comet, Bar Keepers Friend, The Original Kitchen Klenzer, Bon Ami, etc.—just big enough for the rat to fit into without being able to move around, with holes in the metal in one end (where the cleanser is poured from) where the head end of the rat goes, and the other end of the can cut off and replaced with a plastic lid that will snap on with a hole cut out for the tail to go through in the other end. 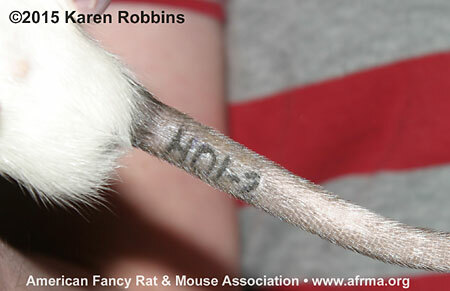 If you have experience tattooing rabbits using a tattoo pen, then you should be able to quickly tattoo a rat’s tail. One difference in tattooing rabbit ears vs. rat tails is the rat tails have small scales to contend with when tattooing. Labs will tattoo tails, toes, ears, or bottoms of the feet on any age of rodent. Other methods the labs have used (not recommended for pet owners) are tiny ear tags (which weigh the ear down and can be ripped out), ear notching/punching (places of the notch/punch correspond to a predetermined number code; not aesthetically pleasing; fighting can do the same thing by leaving nicks, holes, and tears in the ears; used to mark feral cats as being neutered/spayed by ear tipping), microchips (same thing as commonly done with other species of pets), freeze brands (same as is done to ID horses, cattle, or BLM mustangs), or toe clipping (removal of the last toe bone of a digit from one or more legs that corresponds to a predetermined numbering code; only used on neonatal rodents [pinkies] when no other method will work; is painful and not considered humane; can happen with pets from fighting, walking on top of a cage where the occupant inside bites the toes, from being caught in a door or other injury, etc. ; is discouraged by the USFDA for animal identification; Ed. Note: declawing a cat is the same as this but is having all the toes being clipped off and yet people do this to their pet cats all the time which in my opinion should never be done or even considered). There are also leg bands (similar to what is used on birds). A new method of non-invasive ID the labs utilize is biometric recognition where the blood vessel pattern in a mouse’s ear (which are unique to each individual similar to fingerprints) is photographed. We have more information in our online articles Marking Babies and ID for Rats . We don’t require a permanent ID for them to be shown like with rabbit or cavy shows. A recent tattoo on a young rat’s tail. Rat owned and bred by Erika Holbrook. QI have a strange question about my rats which I got from a breeder back in February. Whenever I get a small cut on my fingers or hand or recently on my arm, my rats smell it and go bonkers! It’s scary! They go after it and act like they want to attack the spot. Sometimes I put a band-aid on it too, but that doesn’t stop it. It really scares me when they become obsessed and go crazy. I have to get away from them and not play or pet them till that new cut heals a bit. I hate when this happens. Have you experienced this, and what can I do to keep them from smelling it? Help! AYes, rats will do this. They are especially fond of band-aids so keep these areas covered (shirt sleeves for the arms) and away from the rats until the area is healed. Pet them with the hand that doesn’t have any injuries. There is no way to keep them from smelling it if you let them have access to the hand/arm with the cuts. Also, if you are using an antibiotic to help heal the wound, that could be what they are trying to get to.